Some of you might have your Festive celebrations well planned out, however for those not quite there yet, we’ve put together some tips for planning your Hogmanay break away in Scotland. Scotland has many popular Hogmanay celebrations such as the Edinburgh Street Party and Aberdeen’s Hogmanay celebrations, as well as some lesser known gems, such as the Stonehaven Fireballs Ceremony. 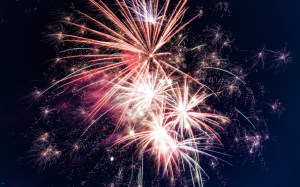 Attending any of these events will definitely begin your New Year with some great memories! View our recent Festive blog that has some fantastic self-catering accommodation recommendations right over here. If you’d much rather have a quiet, relaxing Hogmanay with a more subtle element of celebration thrown in, we can help there too! Edmonston House, located approximately 3 miles from Kelso in the Scottish Borders, is a cosy, chalet-style farmhouse easily accessible regardless of whether you are coming from the north or the south. We guarantee breathtaking views over the valleys that you can enjoy from the conservatory at any time of the year. So whether you are looking for somewhere for a large family or a big group of friends, this property sleeps up to 10 people with 5 bedrooms and 3 bathrooms – ideal. When bringing in the bells, get your parkas and scarfs on and head outside to the garden table to pop open the champagne and catch a glimpse of the fireworks which will no doubt be going off nearby. Spending your New Year here will make the start of 2019 extra special – that’s for sure! 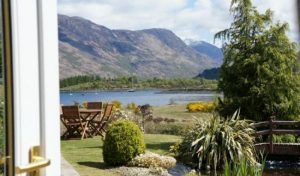 Dalcraig House, situated in Glencoe just 14 miles from Fort William, is a luxurious, spacious, 5-star rated property ready to welcome you into the new year. 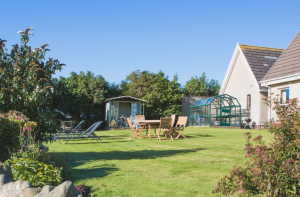 The house sleeps up to 5 people which is perfect for the family or couples. Dalcraig house offers plenty of privacy, plus unrivalled views overlooking the loch – views that won’t leave you for long after your visit. (insert incredible view photo here). Located in Glencoe, you’ll have endless possibilities to immerse yourself in the great outdoors, check out Ice Factor’s indoor ice climbing and rock climbing walls in Kinlochleven or explore Fort William or Oban – both a short drive away in opposite directions. 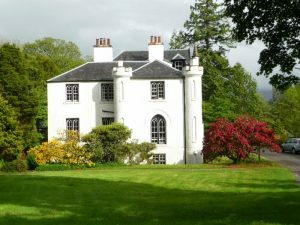 Dalcraig House offers the best of both worlds – a relaxing getaway and a hub for fantastic indoor and outdoor adventures – another great contender for a New Year break. Kinlochlaich Holiday House Apartment, located in the small town of Appin, is made up of 3 spacious apartments suitable for 2 to 4 people all within a historic house. Each self-catering apartment is equipped with an open fire or stove – ideal for cosy-ing round whilst you bring out the bubbly to welcome in the New Year. 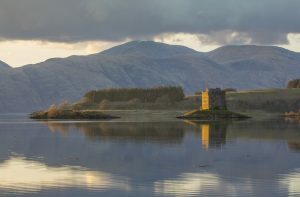 Castle Stalker, made famous in its appearance in Monty Python and the Holy Grail, is just a few minutes walk from Kinlochlaich and although not often open to the public, offers great photo opportunities with the Lynne of Lorne and the quaint island of Lismore in the background. The Old Inn at the bottom of the hill en route to view Castle Stalker, is the perfect retreat to grab a pint by the fire and even meet some of the friendly locals. We’re sure they know how to celebrate Hogmanay too! End your year as you mean to go on and book an amazing getaway today! Find more amazing New Year deals here.